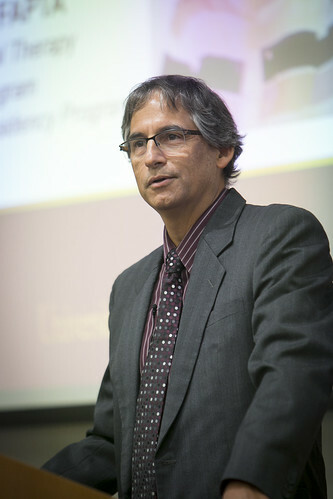 Rob Landel, DPT, Professor of Clinical Physical Therapy at the University of Southern California spoke about managing post-concussion syndrome at the 18th Annual Patricia Leahy Memorial Lecture on September 27, 2018. In the continuing education program for alumni, faculty, and students Dr. Landel spoke about the issues defining and diagnosing concussion, post concussive disorders, treatment, and management. The lecture was followed by break-out group discussions and a question and answer session with Dr. Landel. Dr. Landel established the faculty practice of the division, USC Physical Therapy Associates, was its first director, and continues to treat patients there, primarily those with orthopedic, balance and vestibular dysfunctions. He was the founding director of the USC Orthopedic Physical Therapy Residency Program. He is a Board Certified Orthopedic Specialist and a Certified Strength and Conditioning Specialist. He was elected a Catherine Worthingham Fellow of the American Physical Therapy Association (APTA) in 2012.